The oil bust is threatening to deal a serious financial blow to schools in oil-producing regions across the state — particularly if it lingers. How plunging oil prices are reversing fortunes across Texas. Read all the stories in this series. In December 2014, the week Pam Seipp became interim superintendent of Runge schools, the tiny South Texas district held a symbolic groundbreaking for schools and sports facilities to be paid for by a $22 million bond that local voters overwhelmingly approved just as oil prices began to slip. Seipp’s main responsibility since then? “The bearer of bad news,” she says. Four months into the job, she had to inform the board of trustees that local property values were expected to drop by more than half from the previous year because of a major slowdown in oil and gas drilling, and that the $6 million savings account the 300-student district had built up during the recent boom would quickly evaporate. She delivered a similar message this year with property values expected to plummet another 42 percent amid the lingering low oil prices that have brought drilling in the state — and across the U.S. — to a near halt. The district is now operating on a deficit budget and moving to restructure its bond because it can’t afford payments. Runge is a worst-case example of the budgetary difficulties facing school districts in oil producing regions across the state, where a drilling frenzy raged for nearly a decade until oil prices tanked. But the bust is threatening to deal a serious financial blow to many districts — particularly if it lingers. Several are projecting sizable deficits for the upcoming budget year, with some looking at dipping into savings to break even. Those in a better financial position are delaying pay raises and hiring and hoping that oil production will pick up again. “More or less a disaster,” said Cuero interim schools superintendent Ben Colwell, when asked what he was expecting for the upcoming budget year, and beyond. Property values in DeWitt County, where the district is located, are projected to drop 35 percent this year, which will force the district to cut its $23 million budget by as much as 22 percent. (Final values won’t be known until late July.) That may be doable for one year, Colwell said, but — even as oil prices tick up — he fears there will be a similar drop in valuations next year. Aside from making deep budget cuts and draining savings, Colwell said the other option districts have is to raise taxes. But many in the region are already taxing at the maximum rate, or at least high enough that they’d have to ask voters to approve an increase — something superintendents say is unlikely to happen during the downturn. In 1999, the Legislature passed a law allowing the state to help districts facing “a rapid decline in the tax base” due to factors outside their control by adjusting the taxable value of the property. But lawmakers cut that funding in 2011, said school property tax expert Dan Casey, a partner at Moak, Casey & Associates, an Austin-based consultancy. The problem is particularly pronounced in South Texas’ Eagle Ford Shale, which — unlike West Texas’ Permian Basin — hadn’t seen widespread drilling activity until the recent boom, which rapidly expanded the region’s tax base. Long considered property poor, many school districts in the region took advantage of the newfound wealth by asking voters to pass sweeping bond measures to renovate and build state-of-the-art schools, performing arts centers and football stadiums. 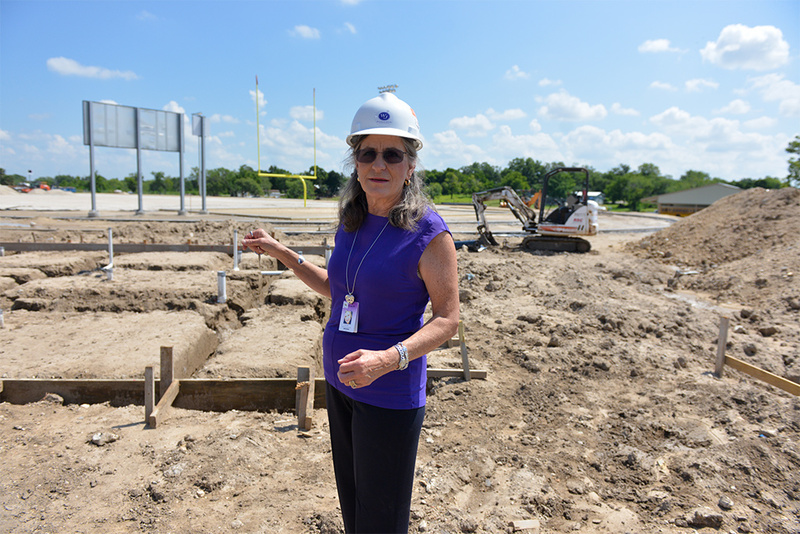 “I really feel for those doing the 30-year notes who don’t have the property values to keep it up,” said Karnes City schools superintendent Jeanette Winn, explaining that her district opted for a shorter bond in case the boom ended earlier than expected. “What we did was we socked a ton of money away to the principal [of the bond], and we’re only paying on ours for 10 years,” she said. Still, the district is postponing all big expenses and plans to cut its budget by 1 percent annually over the next 15 years. Many school officials foresaw the budgetary nightmare a bust would bring, but they say it is much worse than they expected — a "massive thunderstorm" rather than a "shower," quipped Colwell. In less financially fortunate districts, the burden for paying off the bonds will increasingly shift to residents. “The smaller the tax base, the more your taxpayers have to pay because that burden is spread out evenly,” said Mary Springs, the incoming superintendent of Three Rivers schools. 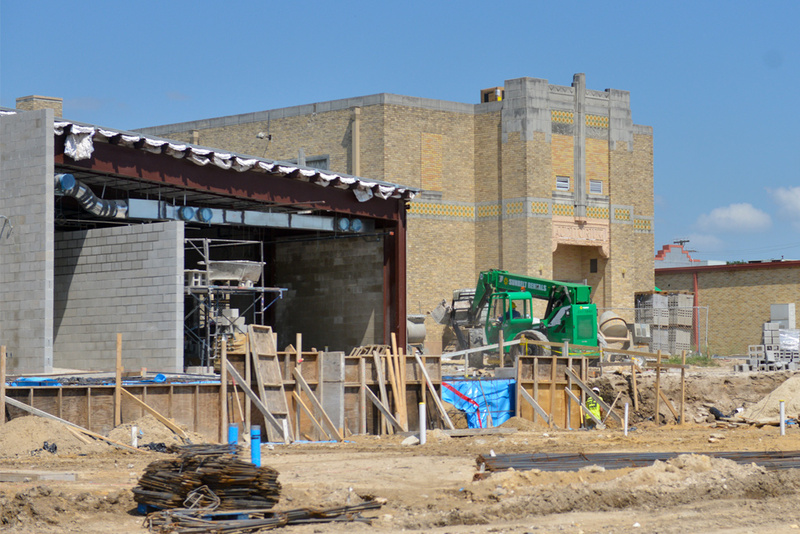 During the boom, the district passed a bond to build a new secondary campus. “The $11 million school featured terrazzo floors, a Valero-sponsored agriculture and vocational building, and a football field carpeted with the same lime-green turf used by the Dallas Cowboys,” according to a Texas Monthly report. Now the 700-student district in Live Oak County, at the heart of the Eagle Ford, is facing a 22-percent budget cut. 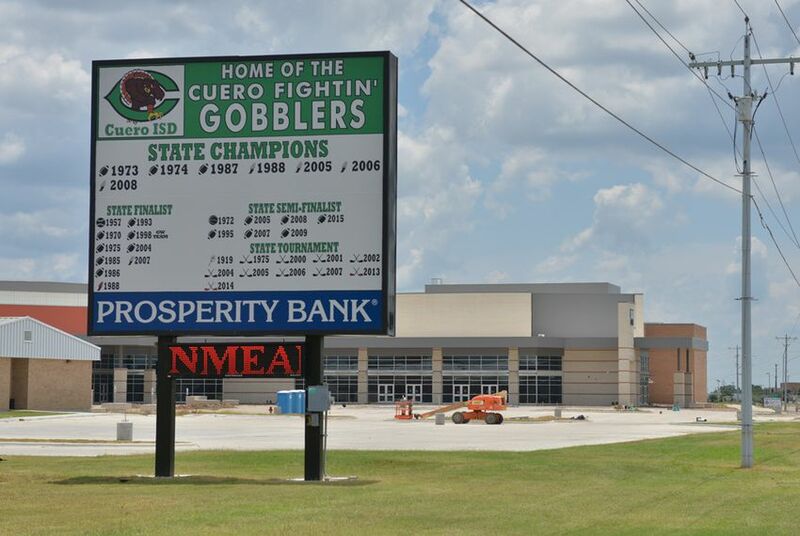 Most Eagle Ford school districts were able to build up savings during the boom that will help carry them through the bust. But the drop in appraisals has been so dramatic in some areas that any financial cushion will quickly disappear. And superintendents point out that most of the newfound wealth has not been not theirs to keep. During the boom, many Eagle Ford districts became classified as property wealthy for the first time, requiring them to send millions of dollars to the state each year to help buoy property-poor school districts under the state’s Robin Hood program. For most Eagle Ford districts, that “recapture” payment is larger — in some cases multiple times larger — than its entire annual budget. Superintendents complain that the state calculates those recapture payments on year-old property tax data, meaning this year’s tabs will be based on collections before the bust took full effect. Districts in the Eagle Ford may look wealthy on paper right now, but they’re really not, said Winn, the Karnes City schools chief. “We have to treat ourselves as poor if we’re going to survive the bust,” she said. Seipp, the Runge interim superintendent, is hoping the district will lose its property-wealthy status soon and ultimately break even. But she readily admits she’s not really sure what will happen. “I’ve got to let them know the picture is looking pretty bleak,” she said of her school board. Several superintendents expressed hope that the boom will bounce back and save them from a yearslong budget nightmare. Industry analysts expect that it will, at some point, although how quickly it will happen remains to be seen.